"Excel VBA is widely used in financial engineering, but many people may not be aware of its true power. 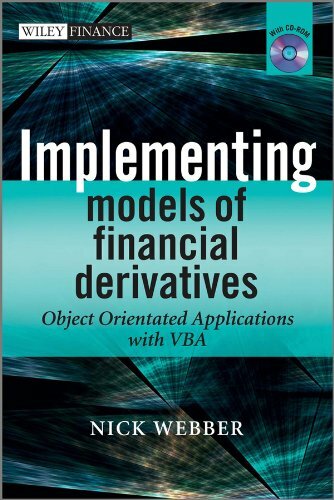 This is an absolutely terrific book that exposes the technical deployment into object-oriented VBA of advanced Monte Carlo simulation for pricing financial derivatives, including the most up-to-date algorithms for dealing with stochastic volatility models, early exercise features and variance reduction techniques. The book deserves to be an important and fundamental tool for researchers and graduate students in financial engineering, and practitioners implementing models in industry." "Comprehensive and carefully written, Webber’s new book is destined to be essential reference for anyone using VBA to price options." "This book by Nick Webber is a well-rounded exposition on the design and implementation of Monte Carlo applications using VBA. What I personally like is the balance between finance, numerical methods, software design and code and these topics make the book stand out and unique. In order to help in the learning process the author takes and incremental and practical approach by producing prototype solutions before progressing to more advanced object-based solutions. Chapters contain exercises that reinforce the reader’s understanding at each step and the source code that accompanies the book makes implementations immediately accessible. This book will give the reader invaluable insights into creating software applications in VBA." Nick Webber learnt to programme with Algol 60 and has been programming ever since. Currently he a Reader at Warwick Business School where, amongst other things, he develops computational methods for the numerical valuation of financial methods although he has also developed fast lattice methods. Before his academic incarnation Nick worked in system design and implementation in industry, both in IT groups and as a consultant. He has taught computational finance in C++ and VBA for many years, in Universities and to practitioners. He combines a research and theory oriented perspective with a long of experience of real applications. He advocates sensible design precepts at all times.